Classy in College: These babies will fly onto your feet. 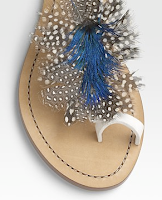 I want to be the girl who walks around campus this summer with beautiful feathered sandals. 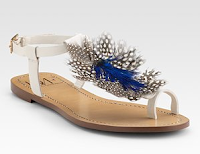 My latest orgo test grade, indecisiveness about a major wouldn't matter Everything in my life would fall into place, if these Diane von Furstenberg sandals were on my feet. Everything except the $200 missing from my bank account (that's $200 less than the fug Marc sandals!! ), but of course with these sandals on my feet...intricately carved Agarwood doors would open for me and I would soon be rich: feathered sandals times a million!